“Mabuhay!” means in the Philippines like “Hello; Welcome; How are you?” The Pilipina Lourdes Manlungat Rudolph, who is living in Kronshagen says: She feels good because she reached, what a lot of people could only dream. She acquired a registration into the Guinness World Of Records with her Dictionary which is translated in three languages, German, Pilipino and English. She prouldy say: “For me, it is the fulfillment of a dream”. Dreams play a big role in Lourdes´ life. Like a better life in a far away country, which moved her to leave Luzon, the biggest island of the Philippines and immigrate to Germany in the year 1976. On the other hand, a fulfillment of a dream requires a lot of courage and diligence. The teacher from the Philippines must start from the very beginning and she autodidactically learned the German language the best she can. The 50 year old lady explained smilingly: “Initially by means of the “Sesame Street” and the “Show with the mouse”. Of course neighbors and friends helped her also in learning. Shortly after all, the secretary was called not only for translation purposes but also for interpretational duties. However, it was still difficult for her to adjust herself in a foreign culture, despite of her office work and the helping hands of her friends. Music is a another dream of her, which helped the dark haired GUINNESS WORLD OF RECORDS holder, to better adjust herself. Then music plays a great role in Luzon, Philippines, the “Pearl of the Orient Seas”, like spanish sea voyagers, the Philippines with her more over 7000 islands once described. Lourdes started singing and playing music from childhood. First of all, at home with her six (I am the youngest and the seventh child) brothers and sisters, finally in college. She said: “I don’t feel at ease without music. I feel sad when I’m not on stage.” She applied as a singer in a Country Band “Crossroad” in Kiel. “Actually, I didn’t have any idea what they might expect from me”, she recalled. Then the gracefull woman never heard this type of music before. “Country? What’s that?”, she asked the guitar player Achim Rudolph before. “The song “Jambalaya” is an example”, he answered and both realized, that the difference isn’t that great anyway. She used to sing this song already in her hometown. In the meantime, the Band celebrated its thirteenth Stage Jubilee and the couple Rudolph celebrated their twelfth wedding day. Their passionately hobby is an eye-catcher once you enter their cosy apartment. Guitars and pictures are hanging all over the hall way, loud speakers and LPs all around, which never look like South Pacific, I would say, rather North America. How could one still find a time to write a Dictionary, having all these activities and hobbies? Nevertheless, she ist not only an Official Interpreter and Translator, Singer and a Housewife, but also a mother of three children. Lourdes laughed: “My colleague asked me in 1992 if I know any form of a reference book, which she could give her research-travelling husband. I didn’t know. This type of book is not in the market” she answered. Not yet, then as she suggested several publishers about this idea, the publishers showed their interests to print such a book. She started immediately transmitting her manuscripts. It took her three years to finish and lastly hold this book in her hands. “It was only possible for me to work for this book because my husband did the household”, she praised her husband Achim. A real reference book is printed, wherein the German words first translated in Philippine translated, then in English language. 23,000 key-words must be translated in “Tagalog”, the national language of the Philippines and then in English, the official language to avoid misunderstanding. Aside from 87 different dialects spoken from different islands, from which Lourdes only two dialects speak, the accentuations in “Tagalog” determines the sense of the vocabulary. 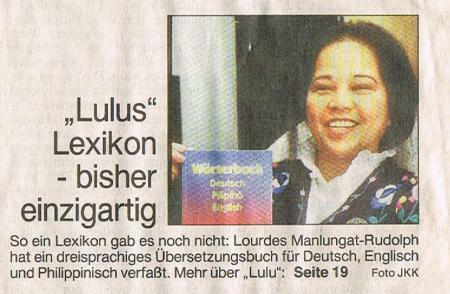 The Philippine Consul in Hamburg suggested Lourdes last year, to let the Committee of the “Guinness Book of Records” to proof the initial existence of this Dictionary. A success: “It is the very first of its kind worldwide!”, pointed the resident of Kronshagen proundly. And the registration into the great Book of Records was assured for her favour. Her Dictionary was even introduced to the public during the “Book of Fair” in Frankfurt and could be ordered through the Web Net Amazon (www.amazon.de). That her motto in life says: (large picture) ”Every problem can be solved with friendliness and a smile“, we would believe these words of Lourdes Manlungat-Rudolph: The native borned Filipina explains this with a lot of gesture and oftenly with a broad smile. 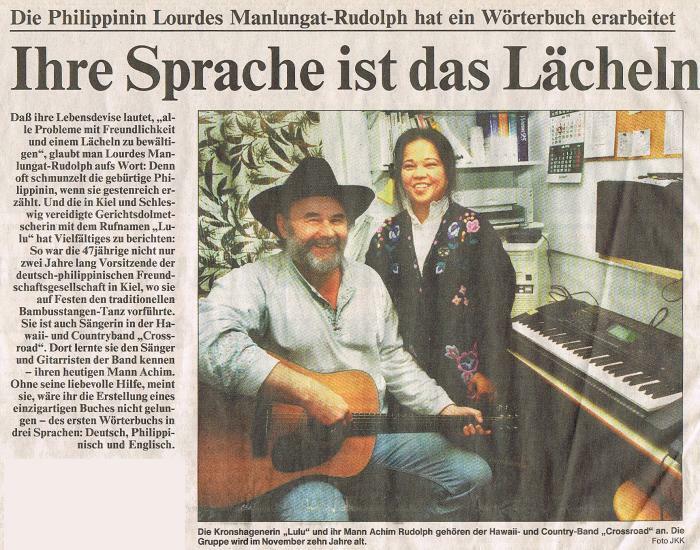 The Official Translator and Interpreter judicially of Kiel and Schleswig with a nickname “Lulu” has various things to report: The 47-year old woman was not only two years long the President of the German-Philippine Association of Kiel, where she performed on accasions the traditional Folkdance with the bamboo poles, but also the female singer of the Hawaii and Country Band “Crossroad”. She came to know there the male singer of the Band – her husband Achim. She exclaimed: Writing a unique book couldn’t be realized without his lovingly help – the very first Dictionary of its kind, in three languages: German, Pilipino and English. The temperamentfully woman worked many years for this dictionary, sometimes until 3:00 ó clock in the morning. She wrote for this book 30,000 words on 300 pages and published early 1997 for the first time (German words at first in alphabetical order). 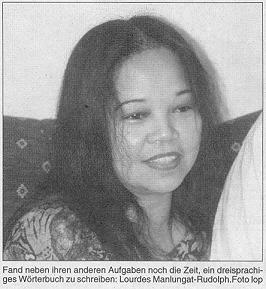 The programmer who is living in Schleswig-Holstein since 1976, has a good command of five languages: German, English, Pilipino (Tagalog) as well as Pangasinan and Ilocano, two out of 87 different dialects of her fatherland which is composed of numerous islands. She said, the communications between the residents of the different islands with different dialects are so difficult. Consequently: “Every Filipino must learn to speak English as industrial language and the national language Pilipino (Tagalog).” Behind different accentuations in Pilipino language can cause misunderstanding: “Suso” means breast or snail in accordance to its accentuation. Her book should help everybody who has interest for this country. She believes that there’s a lot of tourists, businessmen and not but least, the Filipinos who are living in Germany. Alone in Kiel and nearby towns, there are estimately around 300 Filipinos living here.